The other day I was listening to the recent Dept. 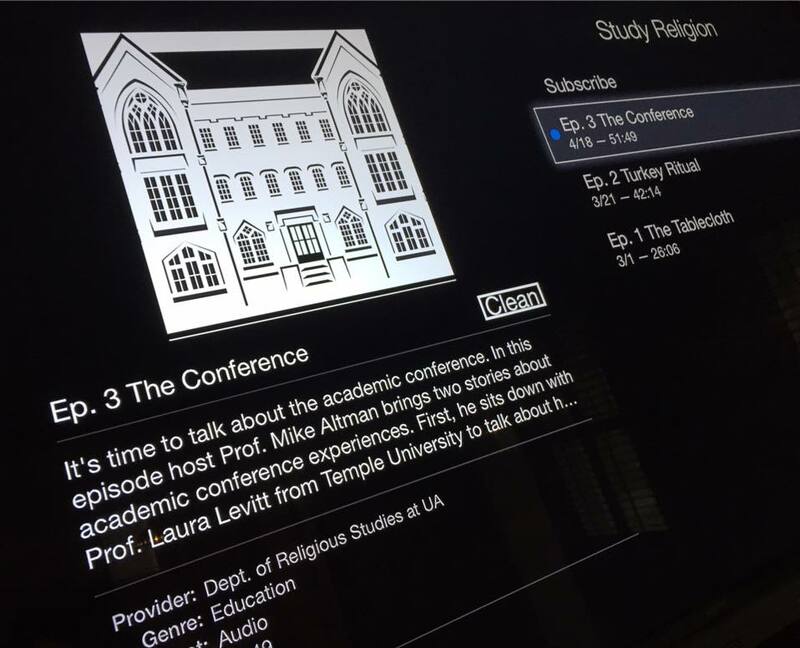 of Religious Studies podcast about conferences, more specifically about the annual meeting of the American Academy of Religion (the national conference for our field’s main professional organization) and SECSOR (the Southeastern regional AAR conference). While listening to this podcast, I related to many of the comments and experiences discussed. But before I get ahead of myself…, for those who haven’t heard it yet, here’s a few spoilers: “The Conference” considers the perspectives of Prof. Laura Levitt, an established scholar who was recently the 15th Aronov Lecturer at UA, and REL major Sierra Lawson (soon to be one of REL’s first MA students) and REL major Parker Evans, both burgeoning academics within Religious Studies. So I thought I’d offer my two cents as a person stuck somewhere in the middle of that spectrum (having just completed my M.A. and about to start my own Ph.D. degree at Emory). While I’m certainly still very early career myself, perhaps this can be a helpful guide to those just starting out. In the first part of the podcast, Prof. Levitt discussed the 2016 AAR Presidential theme of Revolutionary Love and how alienating such a theme can be. Similar thoughts were expressed in this blog series by the Bulletin blog. While not wanting to rehash that debate, her comments certainly resonated with me. What we do in our department is special. We’re not representative of the whole field. Upon hearing this from a professor some years ago, I remember thinking, “Well sure, I know that.” And I had an idea, but only in the abstract. Much as the comments from Sierra and Parker show their surprise with their interactions and experiences at SECSOR, I have often (and yes, still) find myself somewhat surprised with conference experiences. However, it has sometimes been a very beneficial surprise. My first conference ever was when I attended SECSOR in Louisville, KY in 2011 or 2012, I think. I wasn’t presenting at this conference, but we got to meet with different scholars in the Southeastern region, sit in on panels, and try to network. I recall finding my way into a Patristics panel (I got lost in the conference center), and as I sat there listening to these debates over church history, I knew I was in way over my head. I knew nothing of these things, and to my dismay, these debates hardly involved any critical theory. Rather they were discussing what really happened or what so-and-so really meant by saying such-and-such (which had likely been translated a time or two). The more panels I sat in on, the more I came to realize that the conversations I was having in my undergrad classes did not reflect the conversations being had on these panels. As Sierra mentioned in the podcast episode, I, too, didn’t always get the jokes being made around the conference room, but thankfully that didn’t deter me. The next couple of conferences I attended went somewhat differently. Partly because I spent much of my time shadowing faculty, filming them to make a few promotional videos for the Department. So the 2012 AAR looked quite different from that previous SECSOR. I attended more panels that reflected the work I had been doing and learning in class, and that was a nice turning point. Having the opportunity to observe many things behind the scenes, I learned that there is much work to conferences — sure they can be fun, great for networking — but they also require a lot more work than I had previously realized. The following spring, I again attended SECSOR, this time in Greenville, SC, when Prof. Steven Ramey was the President of SECSOR (#impeachRamey). I recall sitting in on a panel about undergraduate education in religious studies. People discussed their syllabi, etc. Having a couple of conferences under my belt, I finally had the nerve to speak up at a panel. It may come as little surprise that I had quite a dissenting opinion from my fellow panel attendees, many of whom I recall promoting world religions paradigms. Though I don’t remember the specifics, I do remember well the reaction my opinion received. I got several funny looks, and a few folks attempted to shut down what I had suggested. Needless to say, I was somewhat rocking the boat, albeit in my reserved, undergrad, not-wanting-to-seem-impertinent sort of way. Lucky for me, the moderator was one of the few who did not dismiss my comments or scoff at me upon learning that I was from, yes, the University of Alabama. When I attended that AAR in Baltimore in 2013, I felt that my being from the University of Alabama made me stick out like a sore thumb. I recall meeting a cohort of then graduate students, most of whom, upon seeing the institution listed on my name tag, looked back up at me and dismissed me with an eye roll and an, “Oh….” By then, I was relatively accustomed to some version of this — after all, I’m not unaware of my mentors and their positions in the field. I did find it rather intriguing though. Or perhaps it was more amusing that anti-reductionists (my qualms with notions of reductionism is another post for another time) would so quickly reduce me to an idea they had of someone else. In my limited experience, when people learn of my affiliation with UA, they immediately make up their minds about who I am. I was very much branded as a UA student, and that certainly has not changed, despite three years spent at CU Boulder. Everyone seems to be aware of my Crimson A well before I meet them. And I quite like that, if I’m honest. So my time at UA continues to be somewhat polarizing for me, as I work my way into the field, but I don’t think that’s a bad thing, necessarily. My training at UA still influences how I do work and research, and I can’t say that everyone likes it. But it’s this continued struggle that has forced me to stay on my toes, such as not getting comfortable with certain normative ideas of the field or how the study of religion should be approached. While I’m still sometimes a dissenting voice in class, I also end up having very productive conversations with people in my Master’s cohort. Being interested in identity politics and classification didn’t necessarily make the PhD application process any easier for me — I had to work to establish what box it was that I fit into. But being aware of these issues within the field — in terms of my own potential marketability and hopes of getting a job one day — has been very helpful. My time and experience in UA’s REL helped me figure out how to navigate an MA program that looked somewhat different from my undergrad, it helped me learn how to do the work I want to do but in such a way that it is still marketable and checks off a certain box. My undergrad courses in REL indeed are not representative of the field. But seeing that disconnect has only highlighted issues that I would hope to address one day. All this to say that REL gave me a very different perspective on the academic study of religion — one that I hope to further in my own career someday. And to be honest, that’s why I’m still in the field. The challenge is good, though. REL prepared me for far more than I ever realized. More often than not I find myself relying on those skills I learned in that 210 Manly Hall seminar room. (Yes, I tried to claim the same seat each week.) So be prepared for a field that’s rather different from our home in Manly, but don’t let that deter you either. You might have to work a little harder and you might not get the jokes around the room, but rest assured, you’re more than prepared. So go ahead, rock the boat a little and tell them that classification is a political act. This entry was posted in Grad Blog, Relevance of Humanities, Religion in Culture and tagged AAR, American Academy of Religion, Andie Alexander, Conferences, REL Podcast, Religion in Culture, SECSOR, University of Alabama by Andie Alexander. Bookmark the permalink.